Homemade pizza is one of my favourite family meals. We love to cook pizza on a Friday night while relaxing after a busy week. This pizza is delicious! It’s made with my beet greens pesto which incorporates Lemon and Basil essential oils. Cooking with essential oils can add wonderful flavour to your recipes. It’s important to only used certified pure therapeutic grade essential oils in cooking. I use and trust dōTERRA essential oils. You can purchase them here. 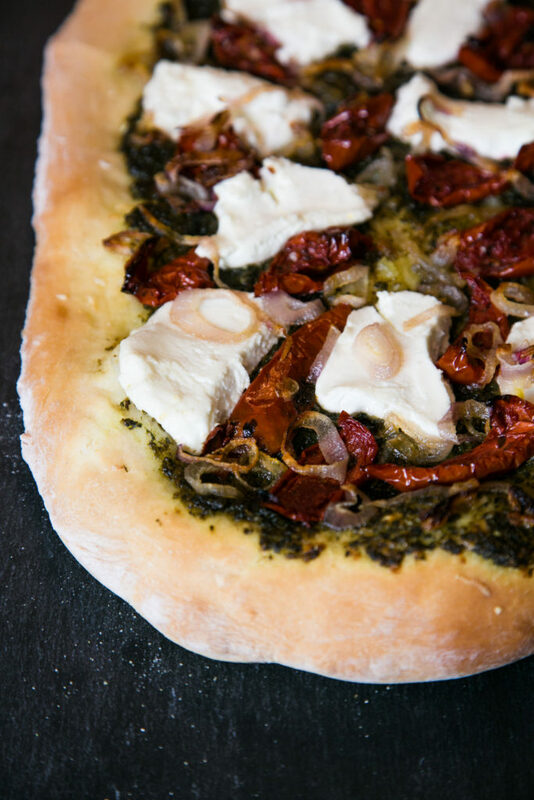 All great pizzas start with great pizza dough. I have made my own pizza dough in the past, but as a busy mom and entrepreneur, I prefer to go to my favourite local bakery and pick up freshly made pizza dough. I always drizzle a bit of extra virgin olive oil over the dough and sprinkle a bit of freshly grated Parmesan before spreading the sauce. 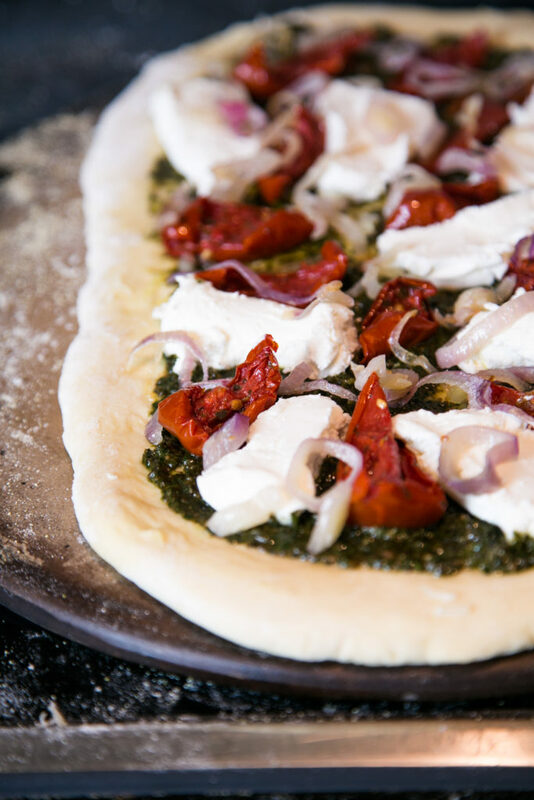 A pizza stone is a must for making great pizza at home. 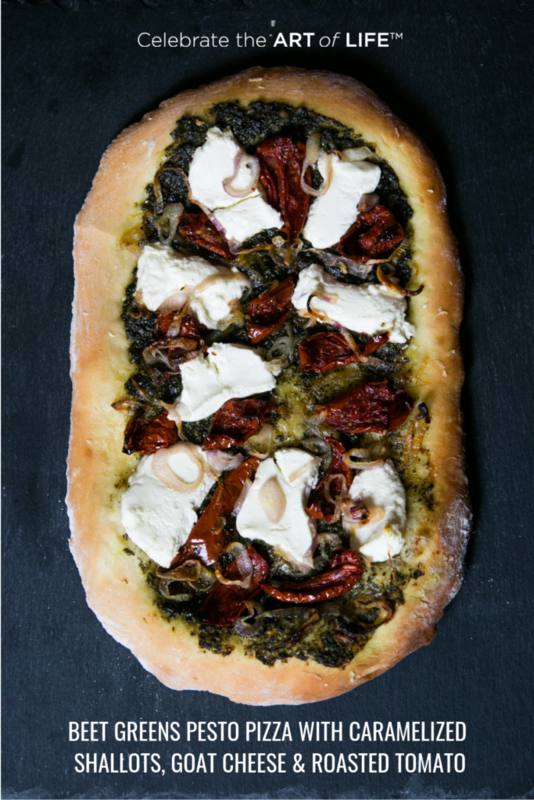 Pizza stones absorb the heat from your oven and help you achieve a beautiful crust. TIP: Preheat your pizza stone in the oven for 30 minutes to bring the stone to the cooking temperature. *Do ahead of time: Cut tomatoes in half lengthwise and layer on a baking sheet covered with parchment paper. Drizzle with olive oil and fine sea salt and roast in the oven at 225° F for 2-2.5 hours. *Or pick up slow-roasted tomatoes from the olive bar at your favourite grocery store! Let pizza dough sit for 30 minutes to an hour in a bowl with a kitchen towel over it on the counter to let it rise before rolling. Store bought pizza dough will stretch better when it has been given time to rise and get to room temperature. One store bought dough will make two thin crust pizzas. While dough is rising, thinly slice shallots and place with butter and sugar in small saucepan over medium heat. Cook shallots until they begin to brown evenly and then turn heat down to low and continue to cook until soft. Separate dough into two equal-sized portions. 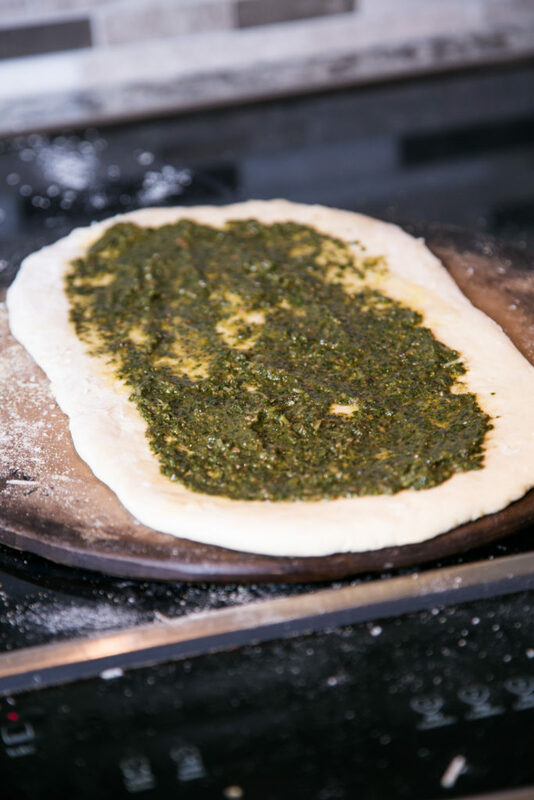 Lightly spread flour over the counter and roll out pizza dough. Sprinkle cornmeal on the pre-heated pizza stone and then lay your dough on the pizza stone. Drizzle extra virgin olive oil ( 1 tsp or so) and sprinkle 1 tbsp parmesan over dough. Layer roasted tomatoes, caramelized shallots, and goat cheese. Bake for 8-12 minutes. *time varies on your oven temperature. Transfer to a wooden cutting board. Drizzle a bit more olive oil over the top of the pizza, and add a bit more Parmesan over the top as well.